Supermarket on Church Street, selling wine, real ale, fruit, veg, flowers, fresh fish, olives, and storecupboard groceries. It has a free cashpoint outside. It opened in April 2015 and is associated with The Wine Cellar in Sanderstead. The property was previously occupied by a bed shop called Dreams. It was vacant by June 2012 photo. It was still vacant and advertised to let as of early December 2012. As of early June 2014 it remained vacant and stripped out photo taken through window, but on 16 June 2014 it opened as the Croydon Pop-Up Emporium photo, a pop-up shop including several small businesses run by Croydon Council. This was not the council's first pop-up shop; they previously had one across the road at number 81 (though that only had one occupant at a time, and possibly only one occupant ever). Many of these businesses continued to trade online after the Emporium closed. As of February 2015, Dalila's Kaftans were also available at the Beyond Expectations wedding shop at 14 Park Street. The London Bridal Boutique opened its own shop at 45 St George's Walk in early 2016. As of late January 2015 the premises were vacant and stripped out photo, but there was a notice in the window photo stating that a company called Allied Enterprises had applied for a licence to sell alcohol from the premises. 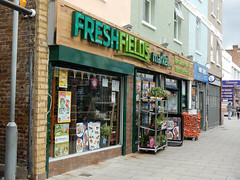 As of March 2015 there were notices in the windows stating that it would be opening soon as a wine, real ale, and food shop called Fresh Fields Market, associated with The Wine Cellar in Sanderstead. This opened in April 2015. Last edited 2018-09-19 16:33:41 (version 44; diff). List all versions. Page last edited 2018-09-19 16:33:41 (version 44).